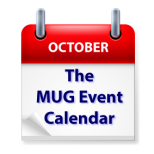 October is off to a busy start on The MUG Event Calendar, with Bob “Dr. Mac” LeVitus making an appearance at one California group, and Joe Kissel addressing another. Home Automation is on the agenda at a Michigan group and iOS 9 will be examined at groups in Colorado and Pennsylvania. Other topics on this week’s list include making good photos, El Capitan, Software Defined Radio, iTunes gift cards, multimedia and more.